PURCHASE 'Looking For The Next One' by S.O.S. 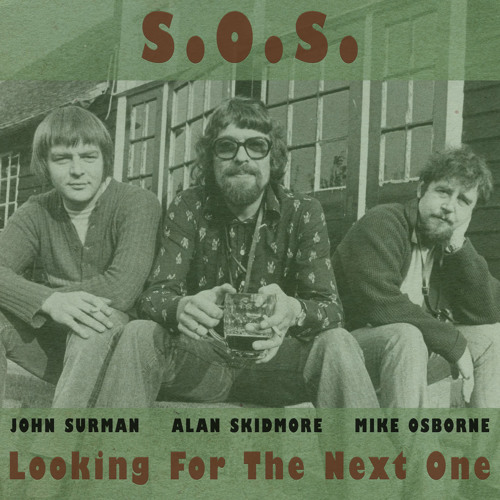 [John Surman, Mike Osborne, Alan Skidmore] @ AMAZON (digital & physical): http://www.amazon.com/Looking-Next-S-O-S-John-Surman/dp/B00BRCQHZ2 WAYSIDE (physical - ships worldwide): http://www.waysidemusic.com/Music-Products/SOS--John-Surman--Mike-Osborne--Alan-Skidmore---Looking-For-The-Next-One-2-x-CDs__Rune-spc-360-361.aspx ITUNES (digital): https://itunes.apple.com/us/album/looking-for-the-next-one/id644196399 BANDCAMP (hi-fi digital): http://cuneiformrecords.bandcamp.com/album/looking-for-the-next-one In 1974, three poll-winning British saxophonists joined forces around a radical concept: Dispense with a bass player and a drummer and go it alone. The result was S.O.S., the trio of John Surman, Mike Osborne and Alan Skidmore, saxophonists who led or played on many of the groundbreaking British jazz recordings of the late 1960s and ‘70s. Although S.O.S. lasted less than three years, they paved the way for World Saxophone Quartet, Rova and other all-sax bands. During their brief existence, S.O.S. recorded only one LP – a self-titled studio album for the legendary Ogun label – that has been frequently cited by critics and historians for almost 40 years as a landmark recording in British jazz history. Undoubtedly, Cuneiform’s release of 'Looking For The Next One', a 2-CD compilation of studio sessions and live recordings, will not only rekindle discussions about S.O.S.’s innovative music among connoisseurs, but introduce their exciting, virtuosic music to a new generation of listeners. The inclusion of the entirety of their legendary July 1974 Balver Höhle Jazz Festival concert is a game-changer, as it reveals S.O.S.’s penchant for connecting multiple compositions with open improvisations, an approach they did not employ on the Ogun album. The concert also documents how Surman seamlessly integrated keyboards and synthesizers – instruments that were overdubbed for S.O.S. – into a performance, and gives more space to Skidmore’s energetic drumming than on the Ogun album. The CD of studio sessions include several unique tracks, including an intense Surman overdubbed solo piece for soprano saxophone and synthesizer, hard-hitting tracks with the late, great drummer Tony Levin – who played with everyone from Joe Harriott to Mujician – and burners like “Rashied,” a tune Surman and Osborne learned at an early ‘70s session with John Coltrane drummer, Rashied Ali. The collection also includes new, extended versions of such memorable tunes from S.O.S., as “Country Dance,” “Goliath,” and “Where’s Junior?,” as well as prime examples of their use of Irish folk tunes and Bach inventions. With a 16-page booklet featuring archival photographs – including shots taken during S.O.S.’s Balver Höhle Jazz Festival concert – and a concise history of the band and their groundbreaking music, written by jazz critic and Point of Departure founder Bill Shoemaker, 'Looking For The Next One' is a substantial addition to Cuneiform’s important catalog of archival British jazz and progressive rock recordings. It not only fleshes out important aspects of their materials and methods, it also reinforces the risk these three celebrated British musicians took in undertaking this endeavor. While Surman had already recorded Westering Home, his first album of overdubbed solo pieces featuring baritone and soprano saxophone, bass clarinet and synthesizer, his reputation was largely built on his high-energy albums for Decca, his work with The Trio (with Barre Phillips and Stu Martin, and contributions to important recordings by John McLaughlin and others. Like Surman, Osborne first gained notice on the mid-‘60s London scene with the Mike Westbrook Concert Band; the alto saxophonist also had a strong connection with the South African exiles who made London their base as a member of Chris McGregor’s Brotherhood of Breath and Osborne’s own trio with Harry Miller and Louis Moholo. Skidmore was renowned for his Coltrane-like intensity and virtuosity on tenor saxophone; like Surman and Osborne, Skidmore played on important early recordings by Westbrook and McGregor, shared the front line with Surman and Osborne on Surman’s early dates, and led his own groups on acclaimed albums released on Decca. Even though they were among the most celebrated homegrown musicians in the UK at the time, S.O.S. still had to contend with a conservative domestic press, wary promoters and a weak economy. While S.O.S. had the enthusiastic support of Steve Lake and other progressive British critics, conservative critics derided S.O.S.’s music, even comparing it to “a strange, barbaric maypole dance,” a typically snarky reference to S.O.S.’ inclusive embrace of Celtic folk elements. When the slumping UK economy shrank local touring opportunities for S.O.S., they found ample work throughout Europe, thanks to the network of presenters Surman had established subsequent to his 1969 “farewell” to London (Surman’s last jam session before departing was issued by Cuneiform in 2005 as Way Back When). However, a number of factors, including Osborne’s declining health, forced S.O.S. to dissolve in 1976. The release of 'Looking For The Next One' provides a timely look back at a pivotal point in Surman’s early career. Far from a sidebar in his pioneering career, S.O.S. helped lay the groundwork for his subsequent recordings for ECM. 'Looking For The Next One' documents how Surman brought together proficient keyboarding, a strong feel for tone color, and folk music-infused melodies to create his signature multi-track “solo” music.